Facebook kept innovating and offering interesting new stuff such as like/dislike buttons, games, close integration with non-Facebook websites, etc., while StudiVZ just remained its boring old self. Since the German press relentlessly bashed Facebook for its privacy issues, StudiVZ thought ordinary users were really interested in this, and spent huge amounts of money creating gold-standard privacy safeguards that won ribbons from every German foundation. Turns out, however, that Germans actually don't care all that much about privacy. When they vote with their feet, it's to go to Facebook, privacy concerns and all. Social networks are only really fun when everyone you know is on them, so once Facebook began attracting a bunch of people away from StudiVZ, all their friends began following, causing a big knock-on effect. Germany just doesn't do the internet very well. There's no casual yet well-financed infrastructure that will fund brash, brilliant kids. Germans — or at least the ones who have money and access to technology — prize 'seriousness' too much, and don't realize that the Internet is driven primarily by gossip, chatter, videos, and games, and that there is serious money in these things. As a writer, he was all over the map. His prodigious memory was, indeed, prodigious, and he was capable of brilliance. And yet, quite aside from his subject material, I never much warmed to him. His writing contained provocation aplenty, but far too much of it, I thought, was tediously bloated, a few hundred words of dashed off substance wrapped around many more hundred words of tired reminiscences, random bile, and frustratingly circuitous filler. It certainly wasn't unreadable, and sometimes it produced a charm of sorts, but mostly it neither persuaded nor even really entertained on any kind of sustained basis. He began going off the rails, if you ask me, in the 90s. I never understood Hitchens' obsession with the Clintons. I could understand his dislike of/lack of respect for them, but it always seemed to me that Hitchens' ire was ludicrously disproportionate to their sins. And then came his intemperate reaction to 9/11 and thrusting advocacy of the Iraq war. The two temptations of the public intellectual: a desire to be near to power (which is different from a desire to wield influence), and a fascination with vicarious violence. We usually associate this sort of moral blindness with Continental intellectuals, but, it turns out, Englishman can catch this virus too. Of course, Hitchens could also be pathetically self-aggrandizing in print, especially after he became rich and famous, but I find that pretty forgivable. For the last decade, though, he was trying much too hard to be a new Orwell, but latched onto the wrong cause. What Hitchens did, pretty brilliantly, was find a niche in the USA in the 1980s. This is my theory, at least: he came to the US and realized that political and public discourse in that country tended to the bland, superficial, and pious. Too many mainstream American commentators were simply afraid of giving offense to various groups deemed out-of-bounds, and wrapped their opinions in layers of mealy-mouthed gauze. The American tradition of journalistic 'objectivity' and horse-race coverage contributed to this insipid discourse. When American commentators did take up a cause, they tended to straight-ahead "Not in My America!" moral outrage, not deft subversion. Hitchens quickly realized that he towered over most of his American counterparts intellectually, and was also, unlike them, willing to call a spade a spade: Ronald Reagan was an intermittently delusional moron, Margaret Thatcher was a bigoted fake, Jerry Falwell and his ilk sinister frauds (and their followers pathetic dupes), Henry Kissinger a war criminal. Hitchens mercilessly, joyfully skewered his targets, blending 1/4 genuine outrage with 3/4 gleeful, unabashed, often-snobbish delight. This was what American intellectuals, with a few possible exceptions, could never master. Sure, they could attack Ronald Reagan, but the attacks were ploddingly earnest howls of outrage. Hitchens attacked Ronald Reagan and had lots of fun doing it, and the fun was infectious. This sort of gleeful, rambunctious, I-don't -just-not-care-if-you're-offended-I'd-be-insulted-if-you-weren't tone is something really only the English can get away with. Yet millions of Americans find it fascinating, as I did back in the 1980s. And to me, there's something bracingly honest about political discourse in the UK to this day. When he was in this mode, and especially when he was combining it with reportage, Hitchens was at his best, and that was fiendishly good. That's what I'll remember him for. And the fact that he continued writing until the very end. The way to solve the euro crisis, at least for the next couple of years, is for the ECB to act as a lender of last resort. The ECB is, quietly, doing just that — specifically by lending money for as long as three years against a much wider range of collateral than it accepted in the past. Even though that money is going to banks rather than sovereigns, the banks will borrow as much as they can, at interest rates of about 1%, and invest the proceeds in Spanish and Italian debt yielding more like 6%, in a massive carry trade. Which means that the ECB is, effectively, printing hundreds of billions of euros and lending it to distressed European sovereigns after all. There’s an argument that it doesn’t really matter whether the banks buy Italian and Spanish debt or not: the main thing that matters is that the ECB is printing money, which is entering the system via the banking system, and which will ultimately find its way into sovereign coffers one way or another, especially since there’s precious little demand for commercial bank loans these days. But I don’t buy it: there’s a virtually infinite number of potential investment opportunities around the world, and there’s no good reason to believe that the ECB’s cash is going to wind up funding Italy’s deficit rather than, say, getting invested in Facebook stock. If Europe’s banks use ECB cash to deleverage and buy back their own high-yielding debt securities, the investors getting that money are not going to automatically buy sovereign bonds with the proceeds…. …The eurozone’s sovereign crisis is here to stay. For an amusing look at the unexpected places this image (from the pro-Nazi era of a German satirical magazine called Kladderadatsch (g)) has been ending up lately, go here. When Will Greeks Attack the German Embassy? Something that strikes me as a bit surprising about the conventional wisdom on this side of the Atlantic about the Eurozone is how few people seem willing to take the obvious victory lap. When the euro project was inaugurated in the 1990s, the vast majority of American economists across the political spectrum were deeply skeptical. Today, that skepticism is being vindicated. The euro has turned out to be exactly the bad idea that many people thought it would be, and for roughly the reasons that the skeptics thought. So why aren't more people calling for this disaster to become an opportunity to unwind a policy that never should have been implemented in the first place? The conventional wisdom is that this is "unthinkable" because un-euroizing would be a "disaster" which it would be. But keeping the 330 million people of the Eurozone and their $13 trillion economy locked in an unworkable monetary system is pretty disastrous as well. Yglesias is right. American Euroskeptics include the center-left Paul Krugman and the center-right Martin Feldstein — a conservative deficit hawk who worked for Ronald Reagan — who predicted the breakup of the Euro way back in 1997. In the U.S., at least, it's really not about political orientation. I was discussing this last night and predicted that the current state of affairs, if it continues, might unleash a wave of Germany-hatred in the Eurozone periphery countries. It is simply an unsustainable situation to have a cabinet of unelected technocrats, with zero support in the population, responsible for pushing through giant, unprecedented budget cuts — in the middle of a recession — that will plunge millions of people out of the middle class, weaken already shaky health and education systems, and cause increases in poverty, homelessness, and suicide (all of which are already happening in Greece). Further, there will be no rapid end to the suffering — drastic cuts in public expenditure during a recession will deepen the recession, causing further revenue decreases, raising debt, creating a self-fulfilling spiral of despair and misery. Even the most popular and charismatic leader would be run out of town for these policies, and colorless, unelected technocrats have no chance. But I predict the anger won't be focused only on them, because they'll be seen as puppets. Many of the people in these countries will see the cuts as being ordered by Germany in order to save various banks. They will see themselves as being sacrificed — against their will and without meaningful political representation — for a policy that benefits Germany, not themselves. And while this is an oversimplification, there's more than enough truth in it to make it stick. Angela Merkel has cut an unfortunately high profile in all of these numberless EU summits. Further, Sarkozy has left enough hints of disagreement with Merkel to permit himself to play the good cop to her bad cop. Increasingly, EU policies risk coming to be seen as driven primarily by Germany. When the enemy was the EU or the IMF, it was too diffuse to permit real, targeted hostility. But if the enemy becomes Germany — well, Germany has embassies, and diplomats, and prominent corporate presences. And unfortunate historical associations. If public anger begins crystallizing against Germany in particular, we could see some very ugly things soon. Perhaps this isn't surprising. But what was shocking to me was the total absence of any recognition that there might be an alternate view. When I mentioned the idea that the euro's problems might not be entirely due to government irresponsibility on the periphery, but rather a balance-of-payments issue (see Matt Yglesias or our own Kevin Drum for more on that idea), people looked at me like I was from space. The fact that German and French banks are holding the bag for Spain and Italy's debt never came up, and no one seemed to have any doubts that the European Stability Mechanism, the fund the eurozone countries are setting up for emergencies, would be sufficiently large to deal with the situation. ….It's possible, of course, that my sample of journalists was oddly skewed and that German media are talking about this sort of stuff. But if Germans really are taking the "worry" side of the story seriously, it's a fringe thing. I spoke to reporters or editors from most of the country's largest papers and broadcasters, and they all seemed unconcerned. What's hard to convey remotely is the general mood: a kind of serenity, an almost utter confidence that everything will turn out fine. I hope they're right. But I'm not so sure. Absent a miracle, Europe is sliding into a recession. This will affect Germany as much as the weaker countries, even more considering its dependence on Eurozone exports. (Germany suffered an exceptionally sharp contraction post-Lehman too.) The result will be a risk of debt deflation in all markets. The sovereign debtors will again face default as public revenue dries up. Speculative assets like real estate will resume their decline. Overleveraged financial institutions—and Europe is the world leader in overleveraged finance—will need to be bailed out. Of course, a rise in unemployment will trigger automatic stabilizers and increase the pressures for discretionary fiscal deficits as well. It is likely that there will be a wave of elections in which center-left parties take revenge for their defeats of the past few years—Germany could lead the way, in fact. Many people think that 2012 will be the make-or-break year for Europe – either a quantum leap in European integration, with the creation of a fiscal union and the issuance of Eurobonds, or the eurozone’s disintegration, igniting the mother of all financial crises. In fact, neither scenario is plausible. The collapse of the eurozone would, of course, be an economic and financial calamity. But that is precisely why the European Central Bank will overcome its reluctance and intervene in the Italian and Spanish bond markets, and why the Italian and Spanish governments will, in the end, use that breathing space to complete the reforms that the ECB requires as a quid pro quo. The bodies of most of the models H&M features on its website are computer-generated and "completely virtual," the company has admitted. H&M designs a body that can better display clothes made for humans than humans can, then "dresses" it by drawing on its clothes, and digitally pastes on the heads of real women in post-production. If you've read this far, let me make it clear that nothing here is meant to absolve the periphery countries from their part in this. Ireland fed the fire of its property bubble irresponsibly, Greece lied about its finances, and throughout southern Europe there was a persistent refusal to reform their labor practices, improve productivity, and live within their means. The core countries have every right to hold the periphery accountable for this. At the same time, this is fundamentally a story of economics, not morality, and it's only in Step 1 above that the periphery countries bear even a share of the blame for what happened. The rest was either a result of deliberate core policies or else the inevitable result of those policies. Whether Germany likes to hear it or not, it's simply a fact that both sides allowed — even encouraged — capital flows to remain imbalanced for far too long. The periphery enjoyed access to cheap money and the core liked having a thriving market for its exports. The core and the periphery both rode this wave up, and now they're both going to have to ride it down. It's also an unfortunate fact that no one handles hot money flows well, something that's doubly true in a fixed exchange rate area. Germany was no better at identifying this and doing something about it than Greece was, and they're no happier about giving up their export-driven economy than Greece is about giving up its import-driven economy. The German embrace of austerity raises an obvious question: If Southern Europe is to cut and tax, how will they grow? The German answer, put simply, is, “like we did.” Ten years ago, the Germans are quick to note, unemployment in Germany was 10 percent and structural deficits were large. Germany was called “the sick man of Europe.” They attribute their subsequent success to a series of painful reforms they made to their unemployment insurance system, their health-care sector, and other pieces of their social safety net. Many figure that if they could do it, so too can Southern Europe. In truth, it’s probably not that easy — Southern Europe doesn’t have the industrial strength that Germany does, and no longer even controls its own currency levels — but it makes sense to the man on the street. 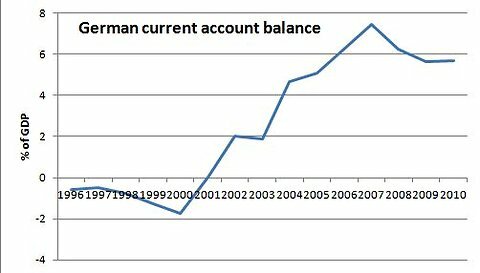 Germany moved from small current account deficits (the current account is a broad version of the trade balance) to massive, and I mean massive, surpluses. So what the Germans are in effect saying is that everyone should run huge trade surpluses. May I humbly suggest that this poses an arithmetic problem? And this isn’t trivial — the adding-up constraint, the point that if Southern Europe is going to shrink its trade deficits somebody has to move in the opposite direction, is the core of the problem.